It’s time to organize for the new year! There is a pile for donations, sell and keep. I’m going from room to room sorting it all out and putting it back in a more organized way. I know it sounds like an easy thing to do, but as I’m doing this one room at a time, I’m not finished yet! I don’t typically make prayer requests a part of my blog post, but I believe in the power of prayer, so I’m just going to ask for prayers. As a child, my parents took quite a few 8mm videos and they were on reels. We had a projector for years, but then it stopped working and eventually we could not find anything to play the reels on, so we had the reels transferred to video tape. The video tape became obsolete, so we took the tapes in to get them transferred onto CD’s. A lifetime of 8mm film was reduced to two CD’s. I type this with tears in my eyes – but I have lost my CD’s! My home movies – my childhood memories – are gone! Please pray that I find them because although you would find them to be a bore a minute, they mean so much to me! I know they are in this house somewhere, I just don’t know where. I keep praying that as I take things out of cupboards and shelves, the CD’s will appear – oh how great that would be! It hasn’t happened yet. I will certainly let you know when it does. Thanks in advance for joining with me in prayer. Where two or three are gathered (even in cyber space…) He is there. As I told my husband just today, whether I find those CD’s or not, my memories are intact in my mind. It won’t bring mom and dad back if I find them. It won’t change anything at all – but I’d just sort of like to find them. 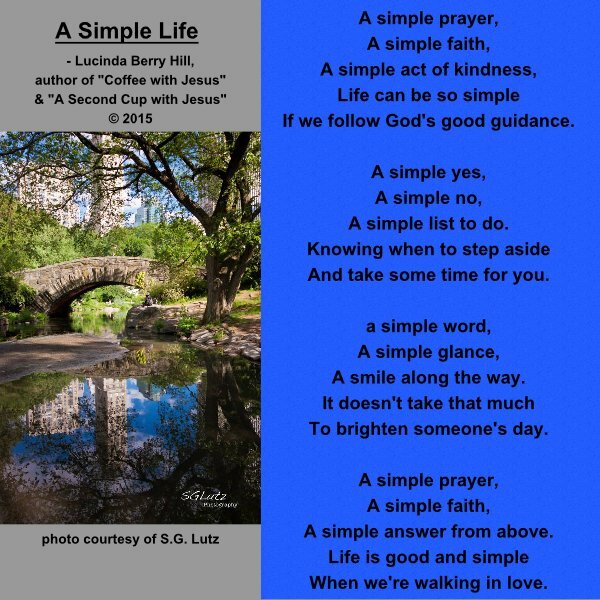 It seems to me that it should be simple to simplify, ya know??? No matter how much effort we put into trying to simplify, it seems we work twice as hard to make it happen. Now, does that make any sense to anyone? No, I didn’t think so. Well, here’s my take on simplicity. I honestly believe that it begins within. How high-maintenance are you, and what would you be willing to live without? I’ve had many friends through the years and have traveled with a few. I never let them know I was doing this, but I was secretly observing the luggage they carried. You see, the things we travel with are the things we are not willing to part with. The more stuff you are willing to live without, the more simple your life will be. If you truly desire simplicity in your life, it’s necessary to let go of some non-essentials. I know they seem like essentials right now, but stay with me. This may make you re-think things. For example, do you need a ton of makeup when you travel? I’m not suggesting you go without makeup altogether (oh, heaven forbid) – but there are ways to travel with less. I take one container of mineral make-up, a tube of mascara, a shadow, brow pencil and lip gloss. Choose one color of lip gloss and plan your wardrobe around that theme color. I usually choose red in the fall/winter months or dark pink in the spring/summer months. I believe simplicity begins with the discarding of extras. It’s about organization and pre-planning. To make life easier, surround yourself with less. It sounds like you would be denying yourself of things, but it is the most freeing experience to rid yourself of clutter and get organized. Recently I went through my closet and took out pieces that I have not worn in the past year – for whatever reason. If you have not worn a piece of clothing in the past year, you probably don’t need to keep it. If you cook on the weekend and freeze each serving, that frees up the weeknight to relax and enjoy your family. Simple. Teach kids to pitch in and help with things like laundry. Even boys will need to know how to do that at some point when they get older, so you’d may as well get them involved now. They will feel like they are helping out and it will take some of the load off you… get it – load – laundry? Never mind. When you make a conscious decision to make do with less, that is when simplicity will become a reality. When you organize things a bit and enlist help from the rest of the family, it will pay off in the long run. I’m not sure how it happens, but the moment I get my laundry all finished and put away – the hamper is full again! It’s magic! Not a good magic, but a very sadistic and twisted magic. And dust bunnies multiply at ten times the rate of their animal counterparts. Today is CLEAN UP YOUR ROOM DAY!!! While I’m sure the day is meant to encourage children to clean their personal space, it also serves as a reminder to adults. Believe me, I know how to procrastinate with the best of them. If there is an excuse to not clean, I’ll use it. There are more fun things I could be doing. 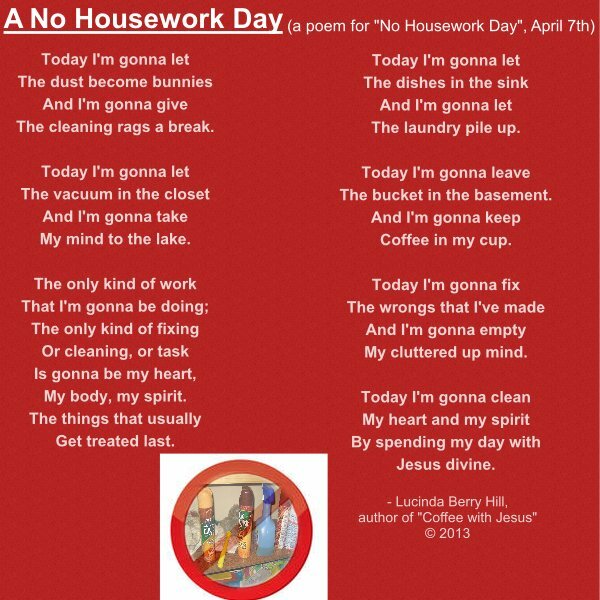 How much energy does a person use when they are doing housework? Let’s take a look. If you mop the floor for half an hour it burns 112 calories! If you get on your hands and knees and scrub the floor it burns a whopping 200 calories! Vacuuming for half an hour burns about 90 calories. Scrubbing the dishes by hand instead of putting them in the dishwasher will burn about 160 calories in a half hour. I don’t know about you, but the last time I spent a half hour washing dishes was after a family Thanksgiving dinner! Although housework is a thankless job, there is a sense of accomplishment when you get done and everything looks neat and tidy – for about five minutes! It’s still worthwhile to tackle it though – and today is the day to go for it! Get the whole family involved in the cleaning. After all, everyone makes the mess, so everyone should have to help with the cleaning. Besides, with help the job gets done much faster! The kids can learn basic organizational skills by watching how well you organize your space. Some people say we make our own happiness – and I have mixed feelings on the subject. I believe God directs my path, but yes, I have a free will and can choose the activities I take part in. To that extent, I most certainly can decide whether I will take a break from work or not. I’ve said time and again, I choose happiness! It is a decision I made a long time ago. Observing these wacky holidays and writing about them every day is part of my choice to be happy. See, I think it’s difficult to find a good reason to get out of bed in the morning sometimes. As strange as it sounds, these wacky holidays give me something to look forward to every day! Some of the wacky days are really off the wall – but I think they are fun and I have enjoyed celebrating them – and celebrating life! Too many people fail to celebrate little things – and we all know that it’s the little things that make life worth living. A towel-folding tutorial for men everywhere. LOL!! !